Alexey S. Tesakov reports that the Russian Stratigraphic Committee has finally accepted/endorsed the lowering of the Quaternary base in the Russian domestic “General Stratigraphic scheme” to the international level. This act was printed in the annual issue of the Committee’s acts (2012): The official decision on the lowering of the Neogene-Quaternary boundary // Acts of the Interministry Stratigraphic Committee and its permanent commissions. Issue 41. Saint-Petersburg, VSEGEI Press. pp. 9-11. The Anthropocene: a new epoch of geological time? heme Issue ‘The Anthropocene: a new epoch of geological time?’ compiled and edited by Mark Williams, Jan Zalasiewicz, Alan Haywood and Mike Ellis. Philosophical Transactions of the Royal Society A369, 835-1112. The GSSP Concept – Report of the International Commission on Stratigraphy Workshop, Prague, May 31–June 3, 2010. Report of the International Commission on Stratigraphy meeting in Prague, 31.5.10 – 3.6.10 by Professor Martin Head (SQS representative). New Earth Epoch Has Begun, Scientists Say – article on National Geographic.com about the Anthropocene published 6.4.10. 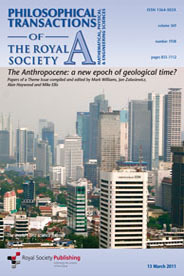 Dec 2009 – First issue of Anthropocene Newsletter published. The Subcommission on Quaternary Stratigraphy (SQS) is a constituent body of the International Commission on Stratigraphy (ICS), the largest scientific organisation within the International Union of Geological Sciences (IUGS).